Building a Better Response, the program providing training to first responders from international nonprofits, has launched its sixth unit on complex emergencies. International Medical Corps, Concern Worldwide, and Harvard Humanitarian Initiative — partners in the Building A Better Response project — are proud to announce the release of an innovative online course. The e-learning opportunity focuses on humanitarian coordination during emergencies characterized by complex combinations of natural disasters and human conflict. Funding is provided through the U.S. Agency for International Development’s Office of U.S. Foreign Disaster Assistance, and employs simulation-based learning to guide participants through an interactive experience that builds their knowledge about humanitarian coordination. Complex humanitarian emergencies in countries such as Syria and South Sudan have resulted in an unprecedented number of people affected by crisis worldwide. The United Nations has reported that humanitarian actors provided services for more people in 2016 than they had since the UN was founded. Protracted crises now last longer and require multidimensional responses, which in turn necessitates that humanitarian staff have sufficient knowledge of the characteristics and challenges complex emergencies entail. This new e-learning aims to address these training needs for responders to complex disasters. To date, over 30,000 users have registered for the e-learning from over 190 countries. 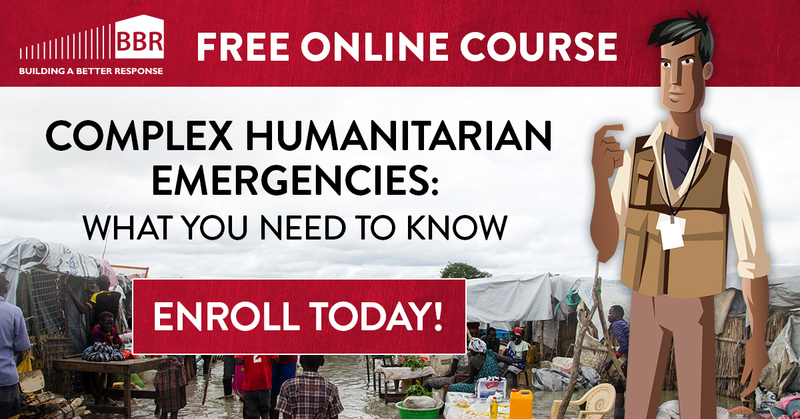 The online course on complex humanitarian emergencies is an addition to the Building a Better Response e-learning. The new course describes complex humanitarian emergencies, elements of coordination among humanitarian actors during such crises, and the challenges in responding to a complex humanitarian emergency. The online courses offered by Building a Better Response are free and flexibly designed to be taken in any order, can be accessed through hand-held devices, and the new course is optimized to stream for low bandwidth usage. First released in 2014, the Building a Better Response e-learning is available in Arabic, English, and French. To date, over 30,000 users have registered for the e-learning from over 190 countries. In addition to the newly launched training on complex humanitarian emergencies, the online course offers learning on topics such as international humanitarian coordination, humanitarian funding and planning, and international law and humanitarian standards. Learners who successfully complete the online course will be granted a certificate from the Humanitarian Academy at Harvard. The online tool can be accessed at BuildingABetterResponse.org.